Resisting the urge to book Caneletto for our last meal of the cruise, we decided to head to the main dining room for dinner. We didn’t get to experience the Culinary Council-inspired menu on the MS Veendam because we ate at the aforementioned Caneletto. We previewed the menu in the morning and felt it was decent enough for us to give it a chance. Also, we had already spent copious amounts of money on drinks, specialty dining and souvenirs from our ports of call. Time to save some cash? 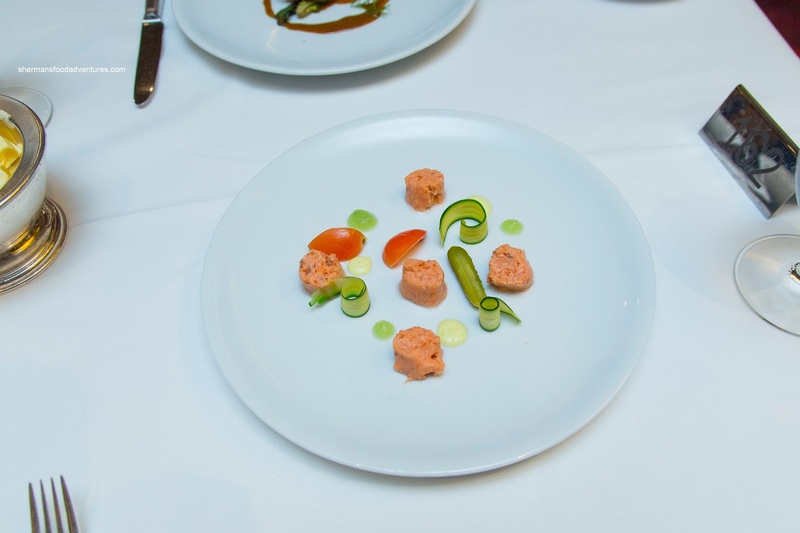 Viv started with the Salmon Tartare, which was more like salmon mousse as it was overprocessed in our opinion. It was sweet though with a light taste of the sea. It was accompanied by baby zucchini, cherry tomatoes, watercress, cornichons and a bacon curry sauce. The plating was interesting while the colors were attractive. Unfortunately, the only thing memorable was the drops of bacon curry sauce. For myself, I went for the Sweet Breads with roast cos lettuce. The well-seared sweet breads were a bit overdone for my tastes, but the burnt bread sauce was impactful and provided a smoky depth-of-flavor. For our soups, I had the Potato Soup with Swiss chard. This was a hearty broth full of tender, yet toothsome Swiss chard and crunchy cabbage. The soup itself was starchy and creamy, but was very mild in taste. However, the small nuggets of turkey sausage provided a robust meatiness. There was also a background spiciness that came through at the end. 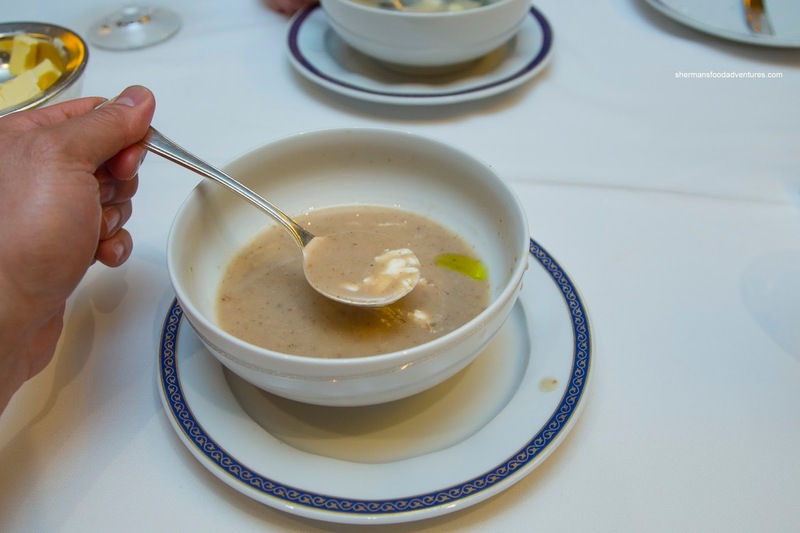 Viv opted for the Wild Mushroom Soup which was not as heavy as it appeared. 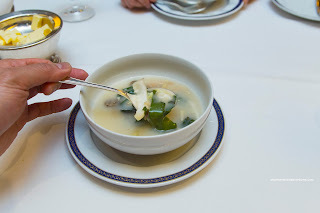 It was not particularly creamy, rather it was brothy but still full of woodiness from the mushrooms. The little pockets of crème fraiche added the missing creaminess as mentioned. We wanted our last meal to go out with a bang so we both went for 2 dishes each. 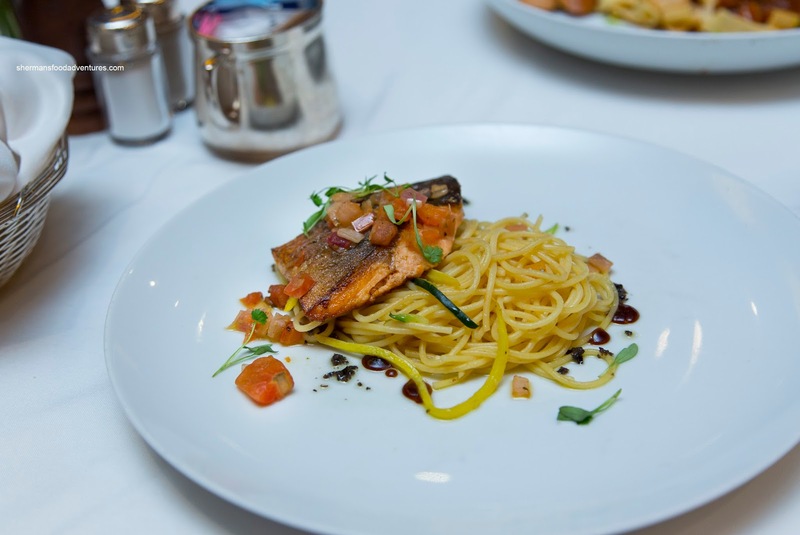 I started with the Pan-Seared Rainbow Arctic Char with spaghetti and sautéed zucchini. 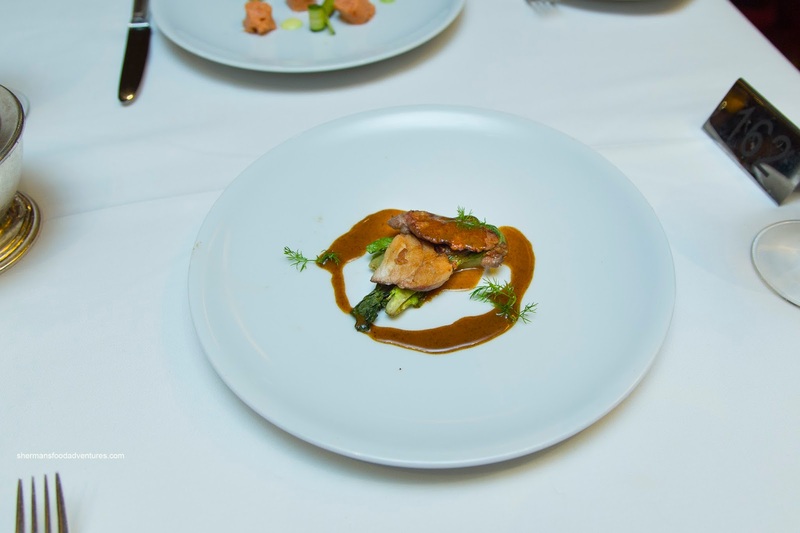 Although the skin was crispy and well-seasoned, the fish itself was overdone bordering on dry. It was also rather bland. Interestingly, the spaghetti was on point being al dente and tossed in seasoned olive oil. 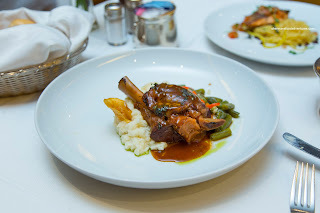 My second dish was the Lamb Shank with cauliflower-rosemary puree and crispy parsnip. I thought the lamb was executed nicely with a tender and gelantinous texture. It was well-seasoned by the silky sauce. Once again, the green beans on the side were in a unappealing shade of faded green. 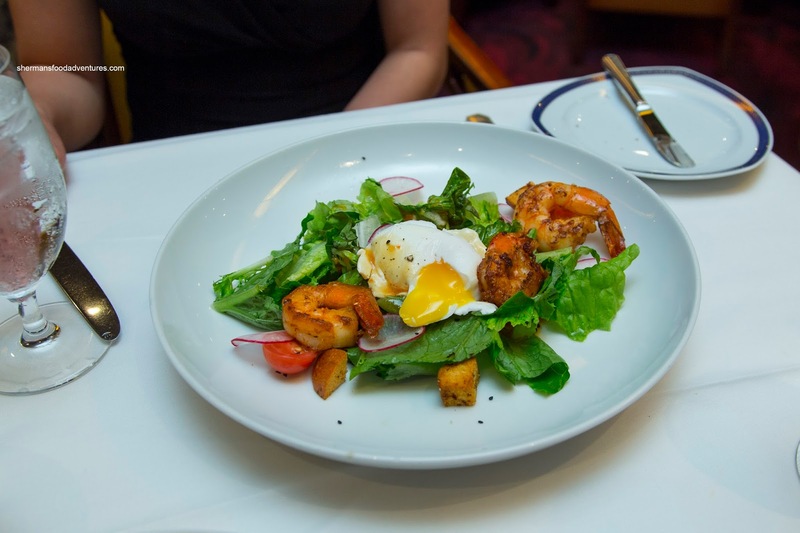 Viv began with the Black Sesame Jumbo Shrimp Baharat Salad that featured a perfectly poached egg, cherry tomatoes, red radish, brioche croutons, cheese foam and citrus-ponzu dressing. Everything about the salad was fine including the acidic and sweet dressing as well as the creamy egg yolk. However, the prawns were too salty and slightly overdone. 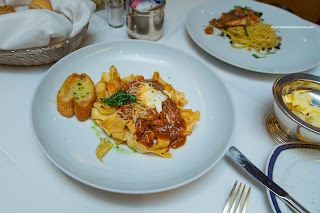 The second dish was much better in our opinion, being the Pappardelle with veal ragout. Finished with ricotta and basil, the sauce was rich and meaty. There was a nice balance of flavors including bits of fennel. The pasta itself was a touch soft, but not terribly so. 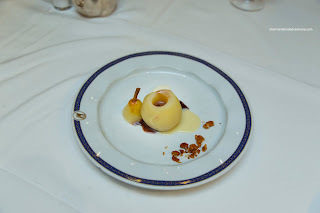 For dessert, Viv had the Poached Pear with chocolate fondue, caramelized nuts and white chocolate sauce. The pear itself was nicely executed being tender, yet still retaining its integrity. There was a light cinnamon flavor to go with the considerably sweet chocolate. 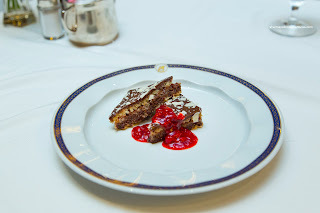 For myself, I had the Esterel Cake which was texturally on point. 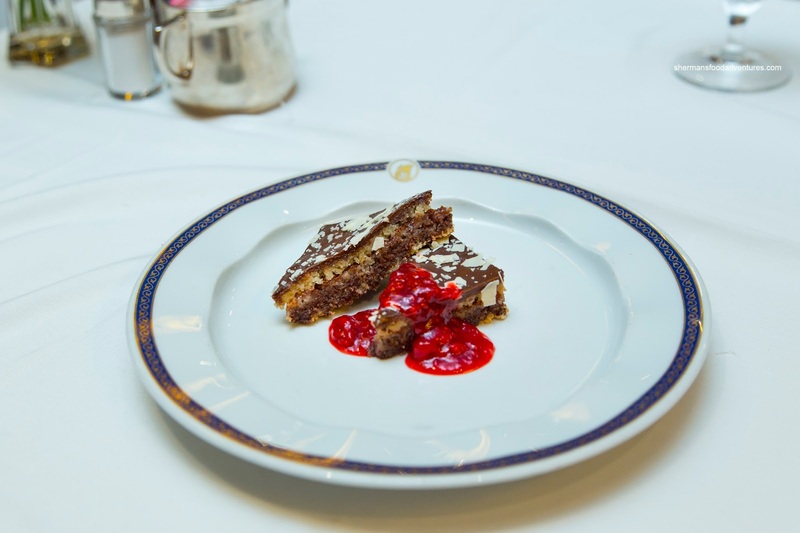 The silky chocolate ganache gave way to moist almond cake. However, it was very sweet though. Even the raspberry preseves didn’t cut through the sugar content. 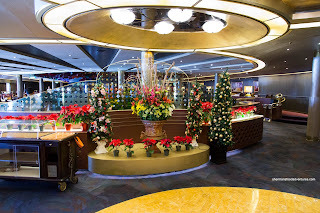 Considering many final dinners we've had on other cruise lines were hardly memorable, this one aboard the Westerdam was acceptable and featured enough variety.